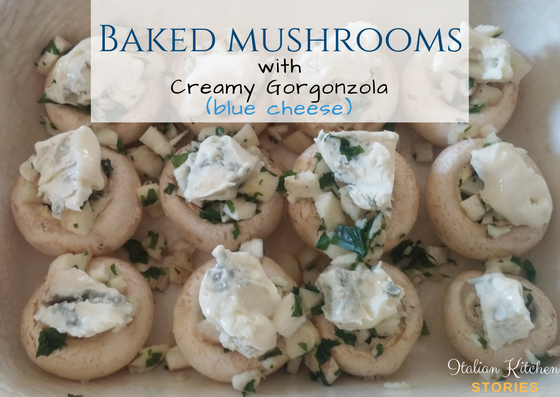 Today I’m going to show you how fast you can make Baked Mushrooms with Creamy Gorgonzola Cheese. 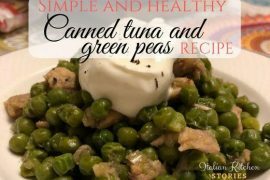 It’s a perfect appetizer for any occasion. Cut the stem but don’t wash them, as mushrooms would soak up the water, just rub them off with the paper towel or brush them with soft brush. Remove the stem, leaving the cap intact. Place the caps in the baking tray with the top facing down. 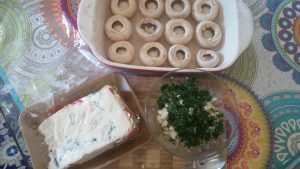 Chop the stems into small cubes, cut the parsley and mix all together. Add salt and pepper and add with a small spoon in each of the cups. 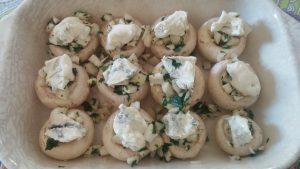 On the end add small pieces of Gorgonzola cheese on top of each mushroom. 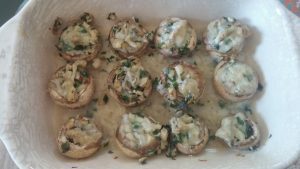 Once the mushrooms are baked, remove them from the baking tray in order not to soak up the liquid mushrooms have released during the baking process. 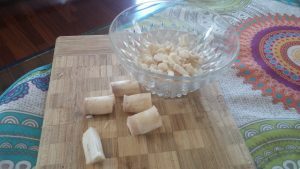 *** Remember – once baked, mushrooms should never be reheated.